Learn how restorative practices can help you initiate and support systemic change to improve school culture, build relationships, reduce truancies and resolve conflicts. Empower your staff and administration to create respect and belonging in school, teach students responsibility and help students find meaningful solutions for the problems they sometimes create. Download accompanying handouts. Explain how to facilitate restorative conversations in classrooms, small groups and individual counseling. 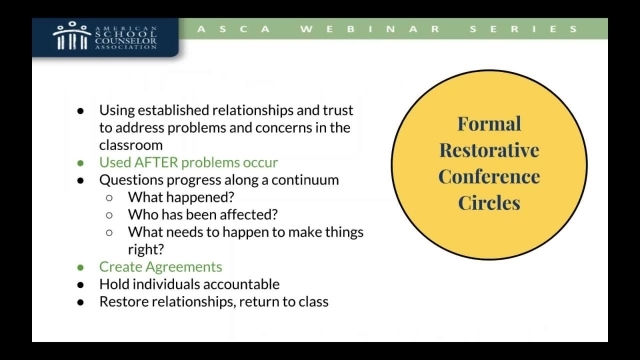 Implement restorative practices as part of a comprehensive school counseling program. Use outcome data to advocate for this systemic change in their schools. Katharine Reid has worked as a school counselor for Franklin Public Schools since 2004, first in the middle school and since 2005 at the high school. She currently serves as K-12 School Counselor System Specialist for the Franklin Public Schools. In 2014, Katharine earned National Board certification and was named Wisconsin School Counselor of the Year in 2017. Mindy Willard is the School Counseling and Transitions Coordinator for the Madison Metropolitan School District in Madison, Wis. Previously she worked as a K-8 counselor at a Title 1 school in the Phoenix area for 11 years and a high school counselor in Franklin, Wis. for 2 years. Her program received RAMP designation in 2010 and in 2013 Willard was the ASCA School Counselor of the Year.